He's one of bit-tech's most prolific modders with several Mod of the Month nominations under his belt as well as an extensive list of mods such as Biohazard, MicroSuperFly and Building Better Worlds to name but a few. This time though, it's E.E.L Ambiense, also known as Jeremy Birch, who is doing the talking. Lumière Noire is also the first 'mod' we've featured here on bit-tech in a while with many previous articles depicting some of the various awesome scratch builds we've plucked out of the community. As always with the more interesting mods, the finished article looks fantastic and a world away from the Lian Li PC-A70 it started life out as. Lumière Noire has truely been modded from head to toe with tweaks needed to install two water-cooling loops, and a host of other features. It's over to Jeremy to see what he has to say. 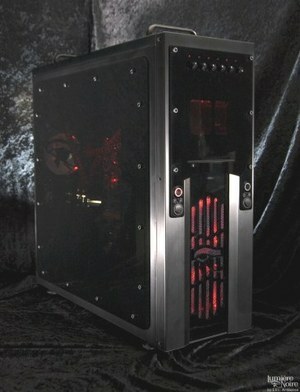 Lumière Noire was built around a Lian Li PC-A70B. Personally, I tend to go for Lian Li cases most of the time for a new ‘canvas’ because they're just a joy to cut. Also, I'm a water cooling enthusiast through-and-through and Lian Li’s full-towers always offer lots of room for all the gear. The system I went with for this build at the time (and admittedly ancient compared to current cutting-edge hardware at this point) is made up of a DFI DK X38-T2R motherboard running a Core2 Duo E6850, 8GB Corsair Dominator DDR2 RAM, a single WD Raptor 150GB, and another WD Caviar Black 640GB for storage. Both of those are housed in twin Scythe Quiet Drive HDD silencers mounted on a custom plexi HDD rack I previously cut and heat-bent. I opted for custom acrylic brackets and a top for the PSU, a custom fan bracket to fill the top PSU slot with an 80mm fan, powder coated fan grills everywhere, customized MNPCTech ‘Phenom’ case feet amongst other things. I also went with a Matrix Orbital LCD display unit that was modded into the chassis and ‘stealthed’ inside the custom front acrylic, as well as a Zalman ZM-MFC1 Plus fan controller also ‘stealthed’ in the upper-most 5.25in bay controlling the two front radiator fans, the three upper radiator fans, and the rear 120mm chassis fan. 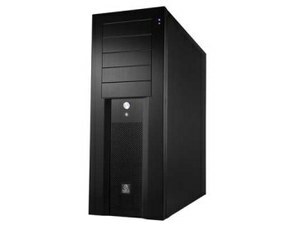 Graphics are handled by an XFX GeForce GTX 280 and the PSU I chose was the Ultra X3 1kW. 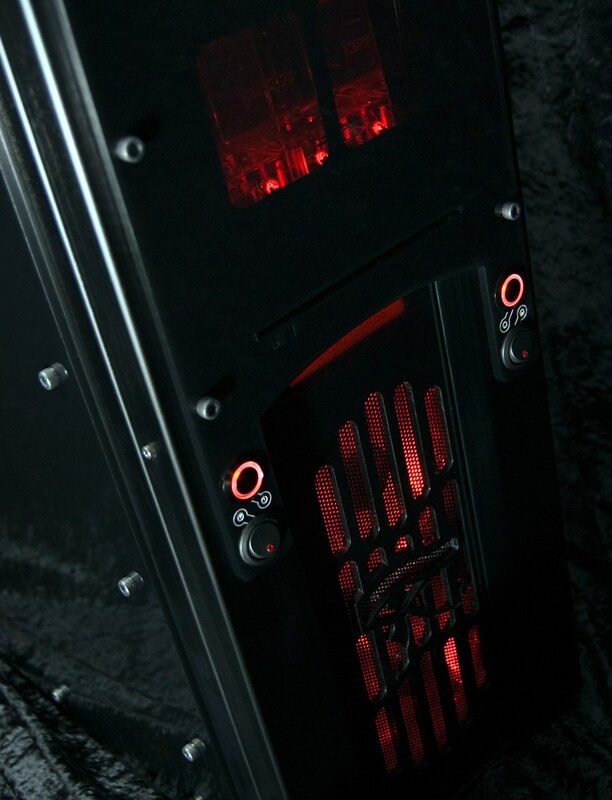 As previously hinted at, the system is water-cooled with dual loops and dual XSPC DDC reservoir/pump combos customised and housed in the top 5.25in bays hidden, with the CPU in a solitary loop using a D-Tek FuZion block. The north bridge and GPU are in the second loop, using blocks from EK Water Blocks, in one form or another, but we'll get to that in a minute. This theme was intended to be black and red from the beginning and I wanted to make sure the acrylic work was stealthy looking too. All the acrylic work, to put it simply, is a series of mathematical equations; i.e. vector. Being a graphic designer/screen printer I tend to work in my native environment. I don't use Google Sketchup or anything like that, nor have the time to mess around with it. Occasionally I’ll set up a 3D-style mockup of things, but I generally draw 2D illustrations (i.e. side, front, top, etc.) of the stock case and digitally mod on top of it. 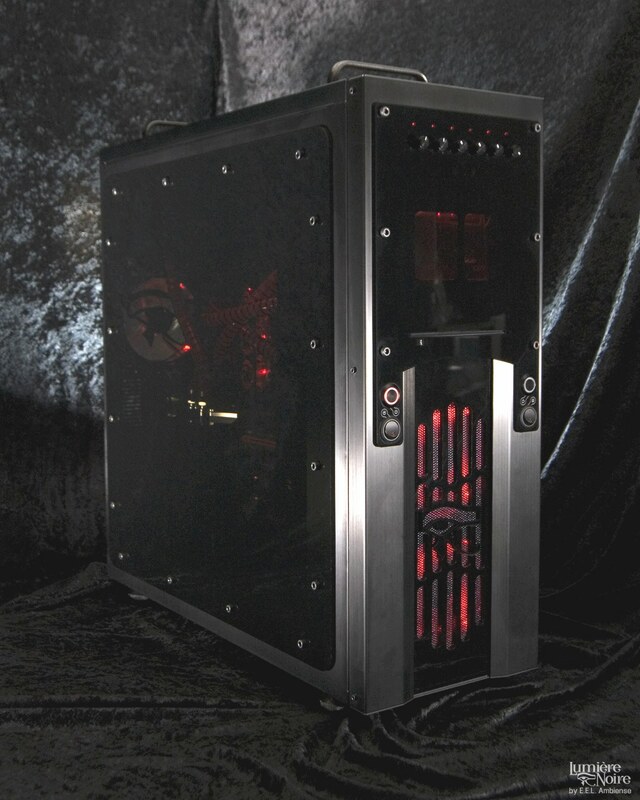 I tend to look at a case and 'see' what I want to do to it. Other mods jump out in the middle of it as well so many get added during the course of the project. LA Noire is a unique combination of game and movie, but it's not without its faults. 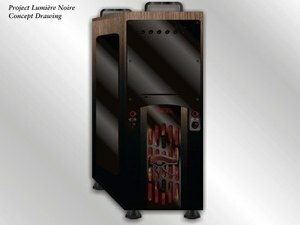 This truly beautiful mod is crafted out of aluminium and real wooden panels. With the PC hardware cunningly hidden behind panels that fit the build perfectly, we experience yet another moment of modding masterclass with the Cygnus X1.